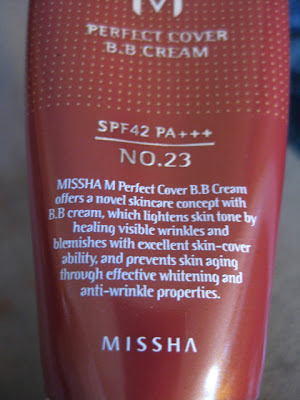 Missha Perfect Cover BB cream (NO.23), my new love! Missha Perfect Cover BB Cream actually come with 3 shades (#21 Light Beige, #23 Natural Beige and #31 Golden Beige) and #23 suits me the best. The consistency is very creamy, gives a light to medium coverage and very buildable. It is definitely heavier than tinted moisturizer but not as heavy as medium coverage foundation. It smells nice and feels very moisturizing. The color goes on a bit lighter at first but since it is self adjust to suit your skin tone, it blends in in like 5 mins. The finish is semi matte and the coverage is very buildable. Some days I use it alone for a quick coverage but most of the time I like to use my Sephora #55 Airbrush, mix 2 pumps of BB cream and a bit MAC Strobe cream, it gives me a natural, dewy look that I really like. After that I will dab some more BB cream on my under eye and the sun spots on my cheek bones and it covers quite well as concealer. The most impressive thing is, I've been using it for couple of months now and I actually see the sun spots on my cheek bones faded quite a bit. This product does work! Using alone for more matte look or mixing with strobe cream for the dewy look. Your skin looks so nice =) I'm still looking at BB creams. Have yet to find one that works for me. Love reading all the different reviews. Thank you for this! You skin looks utterly natural and non-foundation! Great look! Great results, it doesn't look like you have makeup on, but it looks flawless ! nice. You got great skin, and the product sounds wonderful, that it actually make your sun spots fade! Hi~ Is the sonia kashuk's blending brush you love, the pointy one? 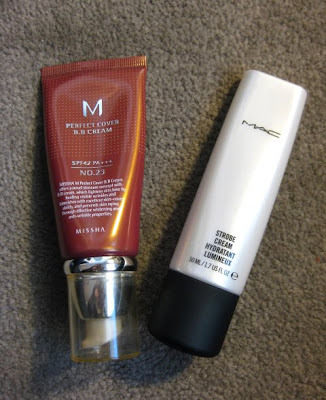 I am using MAC BB creams which is made with natural herb extract with bright effect and also protect skin from damage. 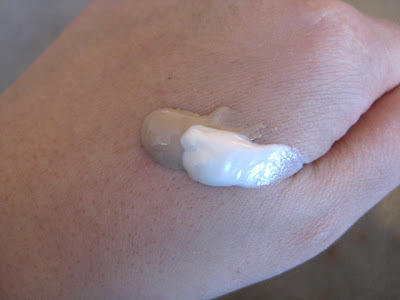 It just looks almost the same effect like you in your photos, and I will love to try the Missha BB cream. Before another year starts, fashion experts and designers always present us with what they think will be the new trends for the coming year. Love makeup and jewelry. I'm into minimalism, tropical modernism, the mixture of sweet and edgy... and all things creative.